Followup on last year's Passaic County Business Summit that attracted more than 80 businesses for networking. This is the second year North Jersey Federal Credit Union hosted the Passaic County Business Summit, which attracted more than 100 local small and medium-sized businesses. More than 100 local small and medium-sized businesses recently turned out for the Passaic County Business Summit hosted by North Jersey Federal Credit Union. 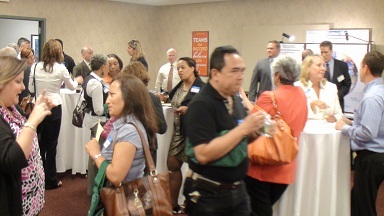 The $224 million financial institution in Totowa, N.J., held its second annual summit Sept. 12 for businesses to take advantage of networking opportunities, develop strategic partnerships to aid with growth and overcome obstacles and to learn about North Jersey FCU’s products and services. Based on a survey conducted by the credit union, many small businesses owners expressed the need to network so they could learn about new trends in best practices and products that could make their operations easier to function. The summit provided information on financing, protecting and growing your business, increasing profitability, planning trends, great networking opportunities and more, according to North Jersey FCU. Last year’s summit attracted more than 80 small businesses, the credit union said.